"When we put this dish on the menu, it was an instant bestseller. In fact, if we take it off, we always get regular customers requesting it. Except for grilling, this is undoubtedly the best way to eat lobster. 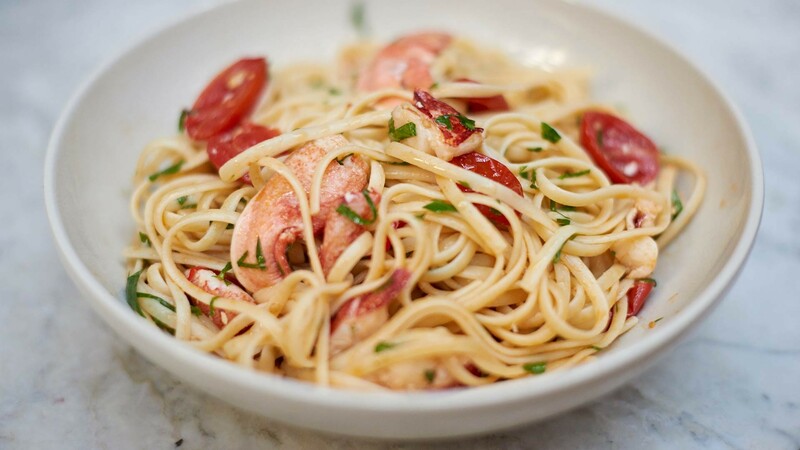 Use very fresh tomatoes for the sauce and have only a touch of it – you mustn't overwhelm the delicate lobster. Always use dried spaghetti for this dish – it has a better consistency and is less sticky than fresh pasta," says Angela Hartnett of this delicious recipe. Place the lobsters in the freezer for a couple of hours before you cook them. This will send them to sleep. Bring a large pan of salted water to the boil and then drop in your lobsters. Cook for 6-8 minutes until the lobsters have turned bright red in colour. Remove and set aside to drain and cool a little. To remove the meat from the lobster, first twist off each claw and leg joint. Using lobster crackers or the back of a heavy knife, crack the claw and then twist out the lobster meat. Peel off the shell to access all the meat inside. Next twist the tail from the body until they crack, and then you should be able to pull out the tail meat in one go. Remove the dark vein running down the back of the tail. Cut the meat into bite size pieces and set aside. Bring a large pan of salted water to the boil and cook the pasta for 7-8 minutes, or according to packet instructions, until al dente. Meanwhile, heat the olive oil in another large pan and add the chillies, garlic and spring onions. Season well and cook gently, stirring for 1-2 minutes without colouring. Add the lobster meat and then the wine. Add a little more seasoning, then allow the wine to bubble and reduce right down for 2-3 minutes. Don’t cook for longer than this or the lobster will go rubbery. Add the tomatoes, cook for 1 minute, then remove from the heat. Drain the pasta and add to the sauce. Toss well, then stir in the herbs, season to taste and serve drizzled with olive oil.